On one side of the ocean, there is Latin America. The earth is intense and full of magic. On the other side, there is Paris and Belleville. A pluriculural, urban, and modern earth. 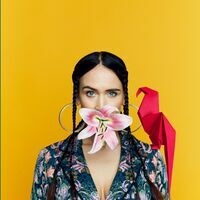 Through her music, La Chica reunites these two worlds, presenting a collage of textures and sounds, ingrained from her traditional heritage and in ux of modern in uences, breaking all modern social standards. Without a mask, this French/Venezuelian artist transmits a brusque state of emotion, oating between abstract thoughts and introspective poetry.